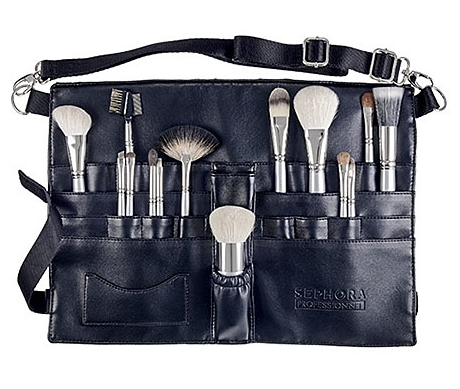 I ordered the Sephora Make Up Artist Brush Belt Set from Sephora.com. The Price reduced from $275 to $99, and you get 15 great quality brushes. What a deal! Perhaps, I was looking for a brush set for a long time. I was interested in Dior which carries good quality brushes. However it doesn't come in sets, I have to buy them separately and those individual brushes are little pricy. I were not willing to pay over $300 on 6 - 8 brushes. When I first saw the brush set online, I doubted about the quality. But I still ordered it, because Sephora has such good return policy. If I don't like it, I can still return it, I have nothing to lose. Today is my second time use those brushes, they are super soft,and barely shed. The most important thing is those tools are very easy to use and help you create a beautiful makeup. The brush set is a keeper for sure. If you are interested, be quick. They won't be there for long. And don't forget to purchase it through Ebates.com, you get 5% cash back.